Hydrogen cylinders are widely used in the hot metals industry; used for brazing of aluminum, magnesium and for welding various metals including lead, steel, and aluminum, stainless metals and more. Hydrogen cylinders are also widely used in the glass industry for forming shapes and rims on glasses. Cylinder hydrogen is the most commonly used laboratory supply source. Advantages: Benefits of hydrogen supply include easy pressure monitoring and control and reliable, continuous flow with little to no gas supply interruptions. Disadvantages: Proper safety precautions must be met for storage and/or handling procedures, product quality can vary and compressed gas can be very flammable and explosive if not stored properly. Before handling or storing hydrogen cylinders, it is beneficial to understand storage techniques and how to compliantly store hydrogen gas cylinders. Learn with US Chemical Storage the advantages, disadvantages and techniques for storing your compressed hydrogen gas compliantly. Hydrogen Gas can be flammable and explosive when stored under pressure. All cylinders must be stored with valve cover caps. Separate full cylinders from empty cylinders. Use inspected gas pressure regulators for compliance. Keep tanks away from direct sunlight and/or heat. When storing other chemicals in the same chemical storage building, a partition wall must be implemented. Hydrogen cylinder storage must not block entry doors or exit ways. Temperature controls may be necessary for proper storage compliance – depending on external climate. Secure hydrogen cylinder storage from movement or falling- support with cartons or special cylinder boxes. Hydrogen cylinder storage must be stored at least 20 feet from flammable and combustible liquids. Proper mechanical ventilation is necessary. Alarms, gas sensors, gas detection and other electrical accessories are required for complete compliance. Hydrogen cylinder storage by US Chemical Storage provides compliant storage solutions for compressed gas cylinders. US Chemical Storage offers extremely safe and dependable compressed gas storage buildings for your hydrogen cylinder storage. Designed by experienced, professional engineers for maximum security and safety. All of our compressed gas storage building are fire rated or non fire rated, depending on the storage distance circumstances. With our SUPERLoc chemical storage building, hydrogen cylinder storage is available inside your facility for increased operational efficiency. 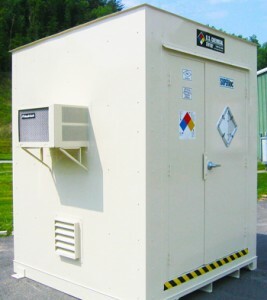 The SUPERLoc series storage building is designed with strength and structural integrity as a focal point. This building is 4 hour fire rated for maximum safety and durability purposes. Exceeding all OSHA, EPA and NFPA regulations, while meeting all FM Approvals and Warnock Hersey standards – the SUPERloc series storage building provides guaranteed compliance and superior strength for all of your compressed gas storage tanks. Call or visit us online to request a free quote to gain compliance today!